TeslaTesla’s Autopilot feature can keep a car in its lane on the highway. Chris Lattner, a former Apple developer, spent nearly six months leading Tesla‘s Autopilot software team in 2017. He left the company last June. On Friday, Lattner criticised the software’s current state on Twitter. He said he was “sad” at the lack of progress he has perceived since he left the company. 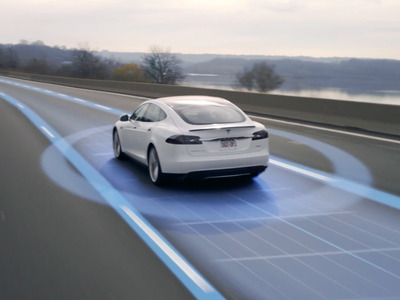 The Autopilot feature gives Tesla vehicles semi-autonomous capabilities in some situations. Tesla’s Autopilot feature has become the subject of controversy again after a Model S that was possibly using the feature crashed into a fire truck on January 22. The feature gives Tesla vehicles semi-autonomous capabilities but is not meant to replace a human driver. 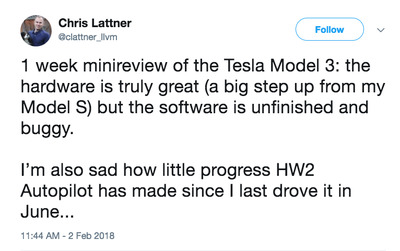 Now, Chris Lattner, the former Apple legend who spent nearly six months leading Tesla’s Autopilot software team in 2017, has expressed his disappointment at the software’s current state. 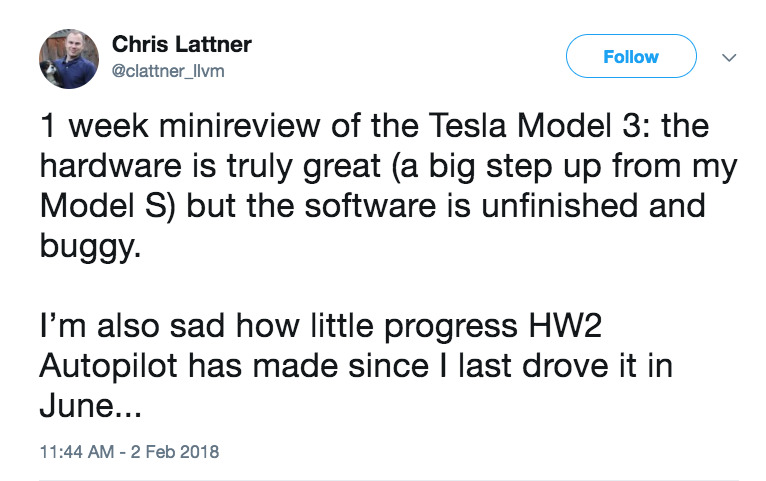 In a post on Twitter, Lattner shared a short review of the Model 3, Tesla’s first mass-market electric car. After working for Apple for 11 years and drawing praise for developing Swift, the company’s popular programming language, Lattner became Tesla’s vice president of Autopilot software in January 2017. He spent almost six months in the position before leaving the company after having a reportedly strained relationship with CEO Elon Musk. Lattner’s departure was a mutual decision, Business Insider reported at the time. It made him the third Autopilot executive to leave Tesla in a period of seven months. Lattner was hired by Google in August 2017 to work on Google Brain, the company’s major artificial intelligence project. Tesla released the last major update for Autopilot in June 2017. The update gave Tesla vehicles the ability to park perpendicularly without driver assistance and removed the speed limit on the Autosteer feature, which allows a vehicle to steer itself in some conditions. Musk has said that Tesla vehicles have the necessary hardware for fully autonomous driving once the necessary software and regulatory conditions are introduced. The company is competing with tech companies and traditional automakers like Apple, Google’s Waymo, Uber, Ford, and General Motors to develop and introduce autonomous vehicles to the general public. Despite a series of production delays, the Model 3 has begun to arrive at Tesla showrooms. Early reviews have been positive.